Black mission figs make an appearance at the farmers’ market and quickly sell out. Piles of dinosaur and curly kale greet shoppers among the throngs of summer fruit and produce. Squash blossoms are ready to be stuffed and served for supper. A shopper does the “squeeze” test while shopping for nectarines. These bright yellow Dolly plums are sweet and eaten when firm. Small pots of German chamomile cheerily bloom and emit their honey-like aroma. First-of-the-season sweet cherry tomatoes glimmer with potential. Little gem lettuce heads make easy starts for salad-making. 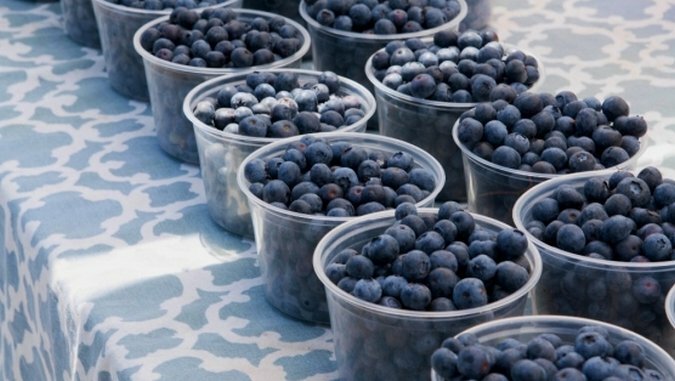 Blueberries in small tubs make perfect on-the-go snacks. Super sweet Albion strawberries are ready to be made into jam. One can be choosy when rifling through sweet organic cherries. Blue Chair Fruit’s melon jam is a spoonful of summer. Getting handy with fresh apricots. Colorful signs describe what’s fresh and for sale. Sticky Medjool dates have become quite popular as a natural sweetener. Farm fresh eggs ready to take home. Soaking up the sun at Splash Pad Park during the Grand Lake Farmer’s Market. Starter Bakery’s popular kouign amann flaky pastries come up in three delectable flavors. Early on Saturday mornings, the sunlight sparkles over Lake Merritt in Oakland as farmers set up shop, transforming Splash Pad Park into the Grand Lake Farmers’ Market. Named for the intersection where Grand Avenue meets Lakeshore Avenue, this farmers’ market is a local favorite. While people may frequent the market weekly to shop for produce, many stick around for the community. Supporting farmers as loyal customers and hearing how the drought is affecting their livelihoods is also a reminder of the importance of all of us conserving water and that we are all in this together. Oakland’s diversity is one of its best attributes. We would expect nothing short of the diversity of the people who dwell in Oakland in the kinds of locally grown produce available. In early June, hearty winter crop kale could be found in close proximity to three different kinds of strawberries being sold at the market. Fresh Blenheim apricots nestled in close to black mission figs and cherry tomatoes, while summer melons were stacked in a bin and ears of organic corn incited a flurry of market-goer activity. Little gem lettuces tumbled on top of one another and bags of mixed greens with edible flowers were sold nearby. The food tents reflect the diversity deeper still. Bite-sized Afghani bolani stuffed flatbread is torn and smeared with no less than two flavorful sauces. Rows of glistening, crackly sweet French pastry kouign amann are sold in three flavors. A few stops down you can find tamales or homemade dim sum. Vegan sushi and homemade tofu, Indian pakoras, fish tacos, and a falafel truck round out the food purveyor offerings where even a Liege waffle truck scents the air with its sweet perfume. Community and diversity strengthen Oakland and the Grand Lake farmer’s market is a fixture for good. Annelies Zijderveld’s first cookbook, Steeped: Recipes Infused with Tea, is available now. She has been published in Curator magazine, Arthouse America, and Sated Magazine. Follow her teatime antics and cooking with tea journey on Instagram @anneliesz.